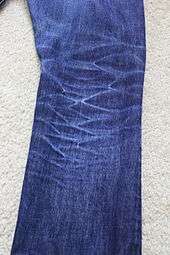 For other uses, see Denim (disambiguation). Denim has been used in the USA since the mid 19th century. Denim initially gained popularity in 1873 when Jacob W. Davis, a tailor from Nevada, manufactured the first pair of “rivet-reinforced” denim pants. His concept for making reinforced jeans was inspired when a lady customer requested a pair of durable and strong pants for her husband to chop wood. When Davis was about to finish making the denim jeans, he saw some copper rivets lying on a table and used the rivets to fasten the pockets. At this time, clothes for Western labourers, such as teamsters, surveyors, and miners, were not very durable. Soon, the popularity of denim jeans began to spread rapidly and Davis was overwhelmed with requests. He soon sold 200 pairs to workers in need of heavy work clothing. Nevertheless, because of the production capacity in his small shop, Davis was struggling to keep up with the demand . He then wrote a proposal to the dry goods wholesaler Levi Strauss & Co. that had been supplying Davis with bolts of denim fabric. Davis’s proposal was “to patent the design of the rivet-reinforced denim pant, with Davis listed as inventor, in exchange for certain rights of manufacture”. Levi Strauss & Co. was so impressed by the possibilities for profit in the manufacture of the garment that they then hired Davis to be in charge of the mass-production in San Francisco. Dry or raw denim (contrasted with "washed denim") is denim that is not washed after having been dyed during production. Over time, dry denim will usually fade, which is considered desirable by some people. During the process of wear, fading will usually occur on those parts of the article that receive the most stress. On a pair of jeans, this includes the upper thighs, the ankles, and the areas behind the knees. After being made into an article of clothing, most denim articles are washed to make them softer and to reduce or eliminate shrinkage (which could cause the article to not fit properly after its owner washes it). In addition to being washed, "washed denim" is sometimes artificially distressed to produce a "worn" look. Much of the appeal of artificially distressed denim is that it resembles dry denim which has faded. In jeans made from dry denim, such fading is affected by the body of the person who wears them and by the activities of their daily life. This process creates what many enthusiasts feel to be a look more "natural" than artificially distressed denim. To facilitate the natural distressing process, some wearers of dry denim will abstain from washing their jeans for more than six months. Most dry denim is made with 100% cotton and comes from several different countries. In particular, the United States, Zimbabwe and Japan are popular sources of cotton for making raw denim. Dry denim also varies in weight, typically measured in by the weight of a yard of denim in ounces. 12 Oz. or less is considered light denim, 12 Oz. to 16 Oz. is considered mid-weight, and over 16 Oz. is considered heavy weight. Heavier denim is much more rigid and resistant to wear, but can also take more wears to break in and feel comfortable. Patterns of fading in jeans, caused by prolonged periods of wearing them without washing, have become the main allure of dry denim. 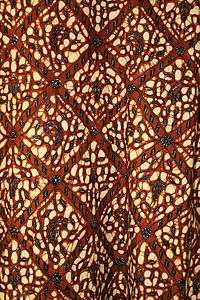 Such patterns are a way of "personalizing" the garment. Combs or honeycombs – These are faded lines that are found behind the knees. Stacks – These are created by having the inseam of the jeans hemmed a few inches longer than the actual leg length. The extra fabric then stacks on top of the shoe, causing a faded area to form around the ankle, extending up to the calf area. Train tracks – These appear on the outseams of the denim. This pattern showcases the selvage by forming two parallel lines of fades which resemble train tracks. Selvedge, or selvage (both spellings are correct), is the edge of a fabric as it comes from the loom. Selvedges are woven or knit so that they will not fray, ravel, or curl. Selvedge denim refers to a unique type of selvedge that is made by means of using one continuous cross-yarn (the weft), which is passed back and forth through the vertical warp beams. This is traditionally finished at both edges with a contrasting warp (most commonly red); that is why this type of denim is sometimes referred to as "red selvedge." This method of weaving the selvage is possible only when using a shuttle loom. Shuttle looms weave a narrower 30-inch fabric, which is on average half the width of modern shuttleless Sulzer looms. Consequently, a longer piece of fabric is required to make a pair of jeans from selvedge denim (approximately three yards). To maximize yield, most jeans are made from wide denim and have a straight outseam that utilizes the full width of the fabric, including the edges. Selvedge denim has come to be associated with premium quality jeans, which show the finished edges from the loom rather than the overlocked edges that are shown on other jeans. 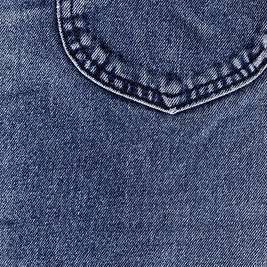 Denim was originally dyed with a dye produced from the plant Indigofera tinctoria, but most denim today is dyed with synthetic indigo dye. In both cases, the yarn undergoes a repeated sequence of dipping and oxidation — the more dips, the stronger the color of the indigo. Rope dyeing is considered the best yarn-dyeing method, as it eliminates shading across the fabric width. The alternative "slasher process" is cheaper because only one beaming process is needed. In rope dyeing, beaming is done twice. 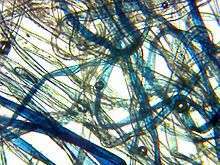 Denim fabric dyeing is divided into two categories: indigo dyeing and sulfur dyeing. Indigo dyeing produces the traditional blue color or shades similar to it. Sulfur dyeing produces speciality black colors and other colors, such as red, pink, purple, grey, rust, mustard, and green. Stretch denim incorporates an elastic component, such as spandex. This creates a certain amount of "give" in garments made from stretch denim. Only a small percentage (about 3%) of spandex is required within the fabric to create a significant stretching capacity of about 15%. However, this feature will shorten the wearing life of the garment. Starting with the 1973 model year, American Motors Corporation (AMC) offered a regular production option consisting of a Levi's interior trim package. Over the years it was available on the Gremlin, Hornet, and Pacer, as well as Jeep models. Although the car's jean material looks just like the real thing, AMC used spun nylon that was made to imitate denim. This was because real denim fabric is not tough enough for automobile use and cannot pass fire resistance safety standards. The copper rivets were the actual versions and the seat design included traditional contrasting stitching with the Levi's tab on both the front seat backs. The option also included unique door panels with Levis trim and removable map pockets, as well as "Levi's" decal identification on the front fenders. 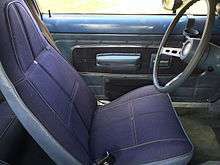 The Levi's interior was available through the 1978 AMC Concord. A Levi's trim package was also made available by AMC on the Jeep CJ line in 1975. This consisted of demin-like vinyl upholstery and a matching canvas top. This option was available on all CJ models in blue or tan, and was the standard trim on the top-level Renegade versions. Between 1973 and 1975 Volkswagen produced the Jeans Beetle, which had all-denim trim. They also repeated this concept in some later models. The dyehouse at the White Oak Cotton Mill, in Greensboro, North Carolina. The Cone Mills Corporation, which owned the mill, was formerly the world's largest maker of denim. In 2007, the worldwide denim market equalled USD 51.6 billion, with demand growing by 5% and supply growing by 8% annually. Over 50% of denim is produced in Asia, most of it in China, India, Turkey, Pakistan, and Bangladesh. The following table shows where the world's denim mills are located. 1 2 Hegarty, Stephanie (2012-02-28). "How jeans conquered the world". BBC News. Retrieved 2015-08-25. ↑ Mogahzy, Y. E. (2009). Engineering Textiles: Integrating the Design and Manufacture of Textile Products (First ed.). Woodhead Publishing. p. 362. ISBN 978-1-84569-048-9. ↑ In 1789 George Washington toured a Beverly, Massachusetts factory producing machine-woven cotton denim. (Massachusetts Foundation for the Humanities: Mass Moments). 1 2 3 4 5 6 Salazar, James B. (2010-06-01). "Fashioning the historical body: the political economy of denim". Social Semiotics. 20 (3): 293–308. doi:10.1080/10350331003722851. ISSN 1035-0330. ↑ Slater, Sean. "When Should I Wash My Raw Jeans? – A Rough Guide". Heddels.com. Retrieved 2015-08-25. ↑ Goh, Yang-Yi (2011-09-12). "Denim Dialogues, Vol. II: Making Them Your Own". Handlebar Magazine. Retrieved 2015-08-25. ↑ "What is selvedge denim?". ↑ Lamm, Michael (October 1972). "AMC: Hornet hatchback leads the lineup". Popular Mechanics. 138 (4): 118–119. Retrieved 2015-08-21. ↑ Statham, Steve (2002). Jeep Color History. MBI Publishing. pp. 101–102. ISBN 9780760306369. Retrieved 2015-08-21. ↑ Foster, Patrick R. (2014). Jeep: The History of America's Greatest Vehicle. Motorbooks. p. 104. ISBN 9781627882187. Retrieved 2015-08-21. ↑ "Chronology and Descriptions". Jeansbeetles.com. Retrieved 2015-08-21. 1 2 Agarwal, Sandeep (2009-10-13). "World Denim Market – A Report on Capacities,Market Size, Forecasts etc.". Denimsandjeans.com. Retrieved 2015-08-25.